nuez de Abisinia, granos de paraíso, Hisp Ar nuezes de xarque or jarque, L. Aframomum melegueta, Ar. jūz aš-šerk, Fr. maniguette ou moix d’Abyssinie, Eng. 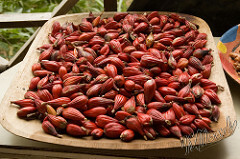 grains of paradise, melegueta or malagueta pepper. Malagueta is derived from Melle, an African empire in the Upper Niger region. The spice was taken from the coast of what today is Liberia, then to ports in Tripoli and from there to Europe. By 1245 in Lyon it was called “paradise gain” as it came from foreign lands. At that time in England, it was called “Parisian grain”. It appeared in 14th and 15th C European cookbooks using it instead of black pepper, which was more expensive. The pungent seed contains tiny, hot and peppery grains. It was used on roasted meat, in spiced wines, hippocras and beer and in stews and broths. Today, the plant grows wild in Ghana. It is reed-like and 1-2.5 m. in height. It has pale purple flowers, which are followed by pear-shaped scarlet fruits inclosing the pulp containing brown seeds 2 mm wide. Often, grains of paradise are confused with other seeds like black cardamom. Although relatives and grains of paradise smell like cardamom, but they are not the same. In Hispano-Arabic xarque or jarque means “colony of the Moros.” There was one is a near Calatayud in the province of Zaragoza where there is a Muslim mosque. Perhaps grains of paradise were grown there. On the other hand for Arabs xarque or jarque means “orient”. Nola calls them ‘nuts of xarque’ in the first two recipes in which he uses them and grains of paradise in others. He adds them at the end of cooking time to the sauce for Merritoche Pottage, in another for roasted squabs, in Membrillo Pottage etc. When pepper prices declined, grains of paradise were forgotten. See cardamomo. Roast the livers and grind them in a food processor. Add grated cheese and vinegar, and grind them all together. 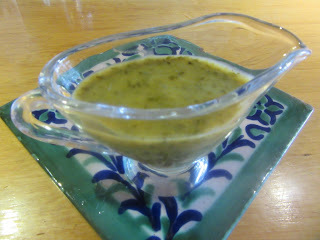 Blend this with 1 c broth or hot water, and strain it through a sieve into a pot. Bring to a boil. Add spices and continue boiling, stirring constantly in one direction, otherwise the thin sauce will separate. Pour over roast pigeons or chicken or serve on the side. Chicken livers were used as pigeons were not available.